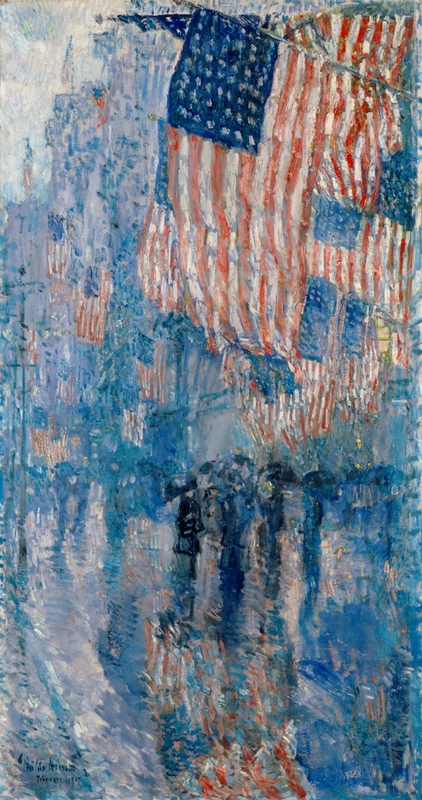 The most distinctive and famous works of american painter Childe Hassam's later life compose the set of about thirty paintings known as the "Flag series". 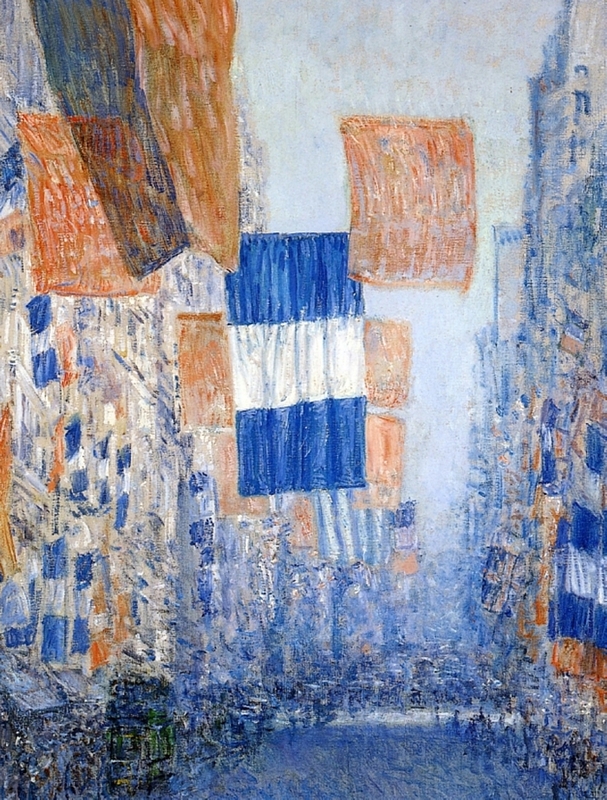 Flag paintings by Hassam are in the collections of the The Metropolitan Museum of Art, the New York Historical Society and the National Gallery of Art. Claude Monet, among other french painter, had also painted flag-themed works - The Rue Montorgueil, Paris 1878. He began these in 1916 when he was inspired by a "Preparedness Parade", for the American involvement in World War I, which was held on Fifth Avenue in New York (renamed the "Avenue of the Allies" during the Liberty Loan Drives of 1918). Thousands participated in these parades, which often lasted for over twelve hours. Being an avid Francophile, of English ancestry, and strongly anti-Germany, Hassam enthusiastically backed the Allied cause and the protection of French culture. The Hassams joined with other artists in the war relief effort from nearly the beginning of the conflict in 1914, when most Americans as well as President Woodrow Wilson were decidedly isolationist. Hassam even considered volunteering to record the war in Europe, but the government would not approve the trip. He was even arrested (and quickly released) for innocently sketching naval maneuvers along the city’s rivers. In addition to the time he gave to many committees, several of his flag pictures were contributed to the war relief in exchange for Liberty Bonds. Although he had great hopes that the entire series would sell as a war memorial set, the pictures were sold individually after several group exhibitions, the last at the Corcoran Gallery in 1922. 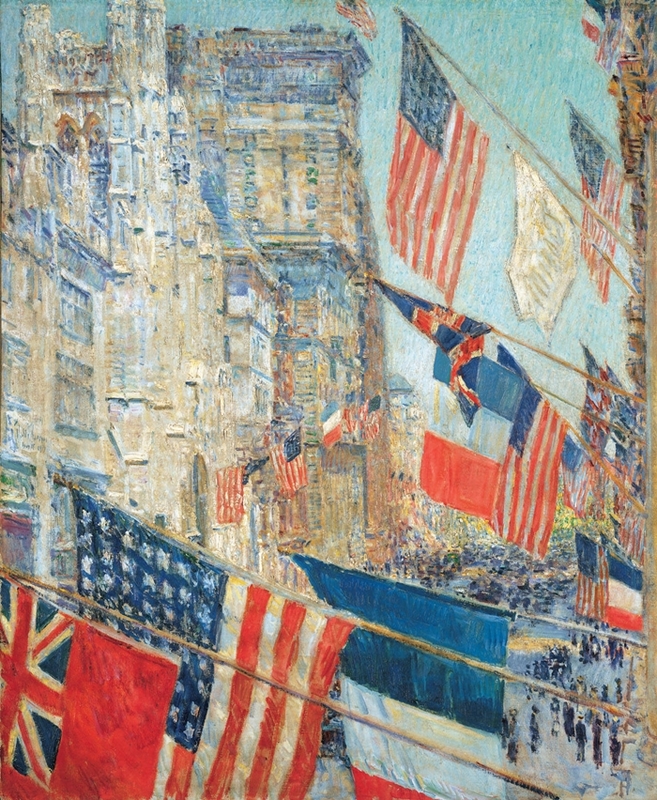 Hassam's have a distinctly american character, showing the flags displayed on New York’s most fashionable street with his own compositional style and artistic vision. In most paintings in the series, the flags dominate the foreground, while in others the flags are simply part of the festive panorama. In some, the American flags wave alone and in others, flags of the Allies flutter as well. House permanent collection since the Kennedy administration, the flags and their reflections are blurred so extremely as to appear to be viewed through a rain-smeared window. On entering the White House, Barack Obama chose to display it in the Oval Office. Hassam's flag paintings cover all seasons and various weather and light conditions. 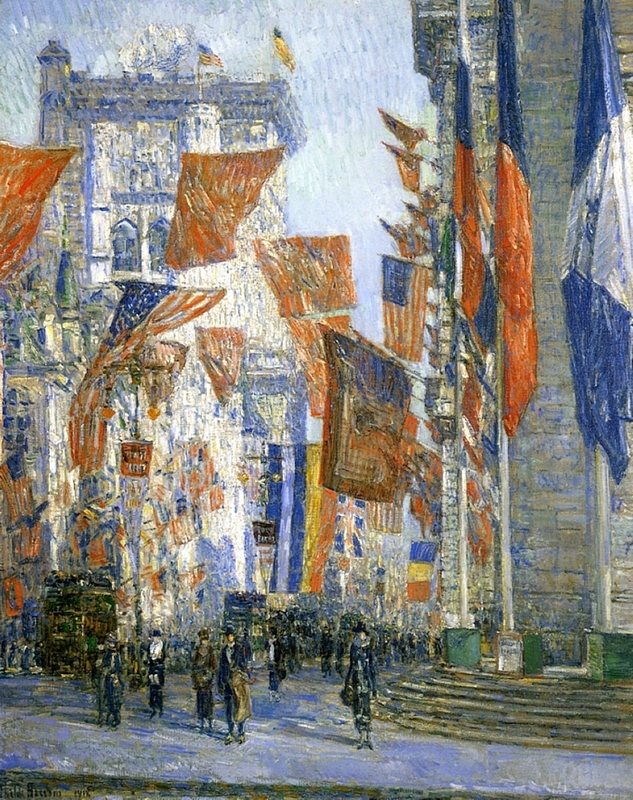 Hassam makes a patriotic statement without overt reference to parades, soldiers, or war, apart for one picture showing a flag exclaiming "Buy Liberty Bonds". 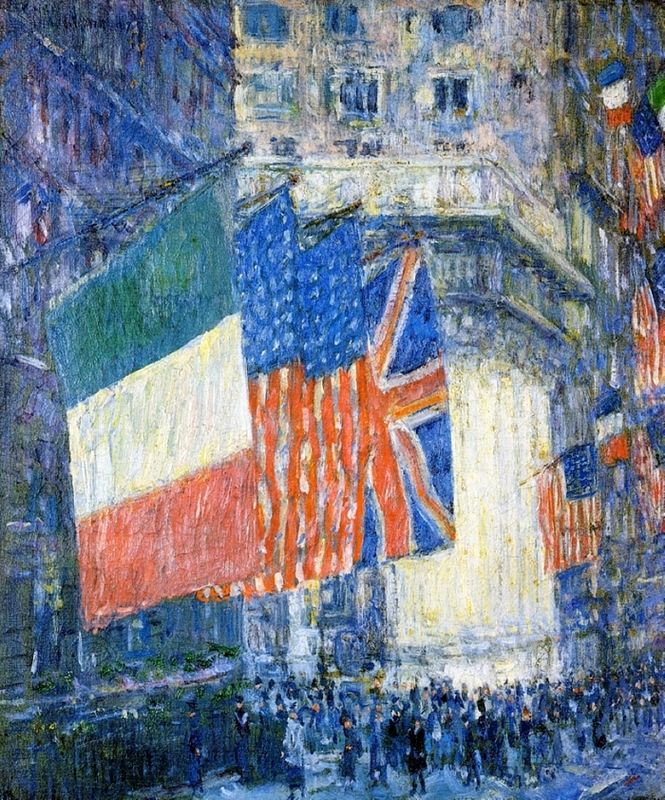 Childe Hassam è noto in particolare per la "serie delle bandiere", realizzata in età già matura. Si tratta di un insieme di circa 30 quadri che Hassam iniziò a fare nel 1916 ispiratogli dalla parata, nella V Avenue di New York, dei volontari in partenza per la Prima guerra mondiale. Di tali opere la più famosa è "Bandiere sotto la pioggia*", poiché fa parte della collezione della Casa Bianca ed è presente nello Studio Ovale del Presidente.